I’ll never forget that evening. It was in Fillmore, California on Mountain View Street. I was four. We all sat around the dinner table, and Dad had just poured milk. I’m pretty sure he was about to stuff some cornbread in it. Thought you oughtta know. I’d spent the day with my cousin, Julie, and she’d told me all about this amazing guy—Santa Claus. He made sure you weren’t a brat, and if you weren’t, he brought you cool presents on Christmas morning. Complete honesty here? I figured I had this one in the bag. In my four-year-old mind, if Julie managed to eke out presents from this old dude in a velvet suit, then I could. I didn’t get in nearly as much trouble as she did. Except while I was at her house. But that’s a story for another day. Suffice it to say, every evil cousin needs a scapegoat. Just call me Billie. Not that I was bitter or anything. And so the dreams of yet another child were destroyed by the truth of Santa. For what it’s worth, I suspect I had the shortest running “faith” in the jolly old elf of anyone in human history. I couldn’t wait to tell Julie that she got it wrong. That’s when my “revenge” withered. While Dad mopped up milk and explained why parents told the Santa lie (his words, folks) to their kids, he also informed me that it was not my job to correct Julie. I was not to tell her that Santa wasn’t real. Okay, I might still be a bit bitter about that. Just kidding. Mostly. Years passed, and I had my own children. We didn’t “do” Santa Claus with them, either. You see, no matter how I might have felt that December night in Fillmore, my dad was right. They could not have told me Santa was real and then later told me he wasn’t. I was one of those kids who would have lost all faith in their word if they’d done that. It’s who I was. Not all kids are that way. Yes, there’s hurt and disappointment when they figure out the Santa myth is just that—a myth. But many (if not most) kids get that it was something their parents did to add enjoyment to holidays. Frankly, I know I created a few self-righteous little snots about it. I’ll go further and admit that I sympathized. A line appeared. I stopped sewing. Skipped back. Tried again. And again. And again. If it had been a movie, all kinds of crazy memories would have exploded on the screen. “Jolly old elf…” Things like that. The story emerged right away. A precocious, bratty kid who was accustomed to getting what he wants and smart enough to do something with that. And a kid who wants all the presents to himself, of course. Let me be a bit “on the nose” here and point out a few things. I can’t stand bratty kids—in fiction or in real life. I’ve very little patience with them, and the child I wrote is awful. My kids looked at me like I’d lost my mind when they discovered what a little tyrant I’d created. 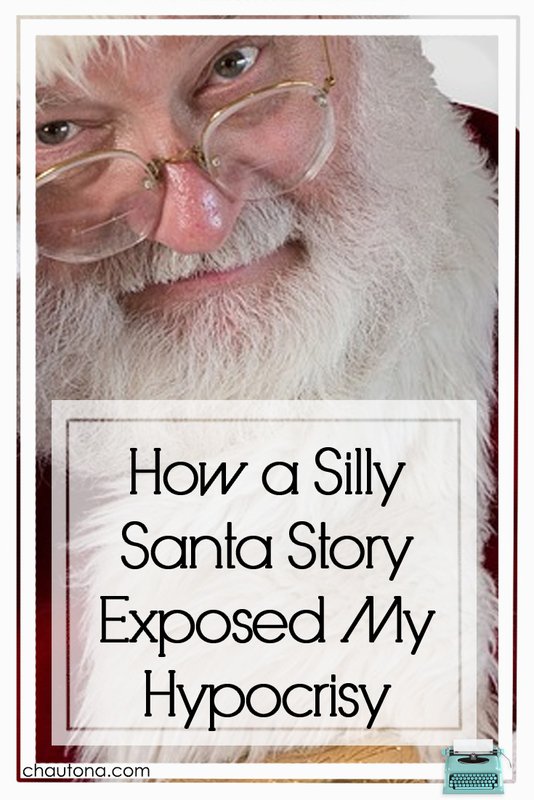 I wrote a book about Santa Claus. My book about Santa Claus doesn’t even hint at the real point of Christmas! Jesus isn’t even mentioned. All three of those are things that would make me run from the book if I saw it in the store. But I wrote it. And, while I’m baring my soul to the world here, I should confess that I had fun writing it. I like the silly little book. As a general rule, I don’t talk about it much on my site here. Why? Well, it’s a Santa story that takes place at Christmas and features nothing whatsoever about the goodness of God. It doesn’t fall under my “Christian fiction without apology or pretense—lived, not preached” motto, you know? However, as they say, confession is good for the soul. So I’m confessing. I wrote it. 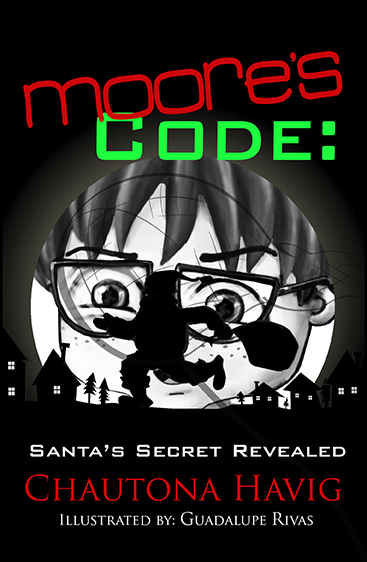 It has cute pictures and silly fantasy elements including a few fun elves and an evil cousin to Santa, Scrooge. You’ll find catapults that fire “snow cones” at the enemy. For the uninitiated, “snow cones” are pine cones with snow packed around them. For the offended, please forgive me. Meanwhile, HERE’S why I usually write Christmas books–ones where Jesus is where He belongs. We are a rare group. We don’t do Santa because when I was in third grade I started doubting and questioning the guy who never looked the same from one year to the next. My dad hired a Santa to come into my bedroom and wake me up and give me a gift (early). He had such a good laugh about it for years and years. “For just one moment you believed.” I thought it was my dad dressed up as Santa, but I was shocked when he called my name at the doorway where he stood watching. So that is why we don’t lie to our kids about Santa… I wanted them to trust me that Jesus is alive and real, even if you canot see him. Well, as I said. I’m a total hypocrite for writing it. I would never have hard feelings about someone ignoring it. I enjoy the others way too much, too. If you like Past Forward, be sure you’re on my birthday list! I wouldn’t want you to miss out on Kari’s Birthday! Finally I have met a person who feels like I do about Santa. The day I found out he was not real I vowed to never lie to my children about it. Why? Because as a small child I cried, not because it ruined my belief, but because I felt sorry for all the children who believed and did not get a gift for Christmas and could not understand why they were not good enough. I learned then that there is never a good reason for a lie. Yeah, it’s not for me. I get that most kids don’t have that kind of betrayal feeling, but man, I would have. My parents were so scrupulously honest with me, I would have lost all trust in them. I am, and always have been opposed to anything Santa. Now I’m going to break a lifelong thing and read a Santa book. Why? Because you wrote it and I’m curious. I’m so very sorry. LOL. It was one of those, “Wow. I found something quirky. I have to DO something with this.” And it’s fun. But it’s totally silly and of no eternal value. Unless it’s that you’ll love the grandpa and his wisdom. I do think Grandpa is an awesome dude. I CAN!!! But I was involved in a whole lot of conversations with you during the writing of Moore’s Code, so it wouldn’t be fair. I still enjoy this book, and am so very careful not to end up on Santa’s permanent naughty list..can’t be too careful, you know! Love the play on words, er — names. Clement Moore wrote The Night before Christmas. I have no idea how to Translate Morse code. but I am in awe of the people who did it – in old movies etc. ha ha We never “did” Santa either, so I can identify with much of what you wrote. Love your honesty. Now I HAVE to go read that silly story..
We don’t do Santa, either. All six of our kids were adopted from Ukraine at an average age of five. I couldn’t reconcile how to explain why Santa never visited them in the orphanage but would now that they had a family. All of the stories and popular culture say that Santa visits “good” kids. What does *that* tell all of the orphans?? That is a fabulous (and awful, you know) point! You made me laugh!! Now I can’t NOT read this book. ?? ?